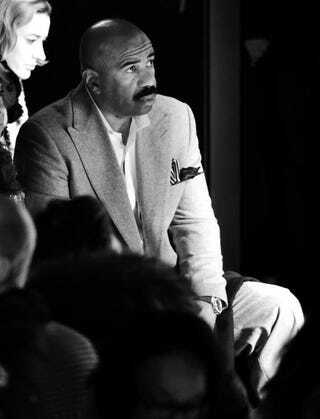 Steve Harvey attends the Prabal Gurung Fall 2016 fashion show during New York Fashion Week: The Shows at The Arc, Skylight at Moynihan Station, Feb. 14, 2016, in New York City. Steve Harvey wants women to know their worth and that they can train men (whom they deem worthy of training) to treat them like the ladies they are. During a segment of his show that addressed the topic of sexting—engaging in sexual talk over text—Harvey lectured a young lady about her value. It was a great speech. Check it out below.